A bronze vessel of rounded bowl form supported on a tall, sloping foot. The body is cast with two curved handles that are attached just below the flat-lipped rim by animal heads. The heads have intaglio engraved features of bulging eyes and pointed ears. At the bottom of the handles are short pendants engraved with the outline of a neat hook. Around the neck is a frieze composed of eight stylised snakes, centred on either side by a crisply-cast taotie mask in high relief. Just below the heads of the handles, the body is encircled by a plain ridge. The decoration of the main body consists of a wide band that in corporates five rows of projecting, spiky studs, each centred on a diamond pattern and filled with repeated leiwen pattern. The foot is adorned with eight stylized horned birds separated by a central raised ridge on each side. The interior of the basin is cast with a nineteen-character dedicatory inscription. The vessel is covered in a pleasing green patina, with substantial areas of malachite colouring. 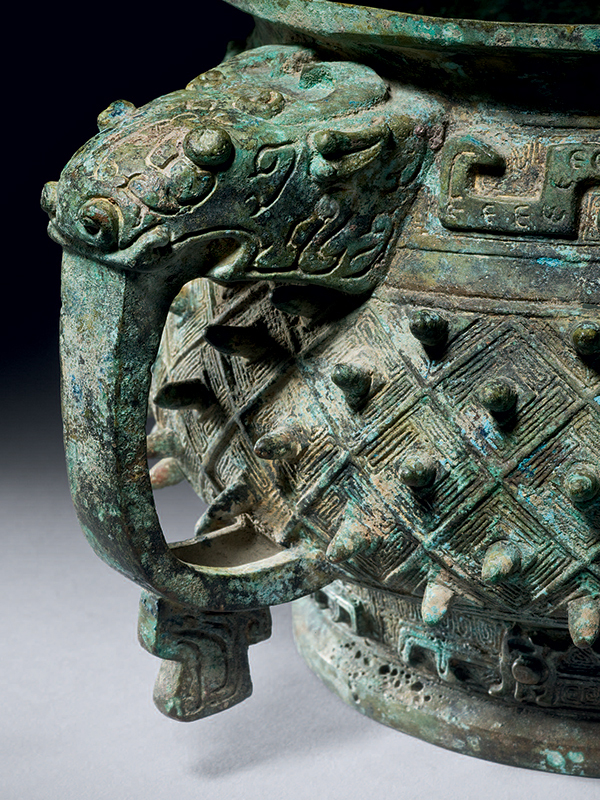 The gui vessel is one of the oldest and most classical shapes in the repertoire of Chinese bronzes and was used to make offerings of grain and vegetables. The form derives from a pottery prototype that first appeared in the Erligan period (1600 – 1400 BC). The decorative pattern of raised bosses framed by diagonal lines enclosing leiwen pattern was used on round-bodied vessels, such as ding and yu, and were first produced in the Shang period. 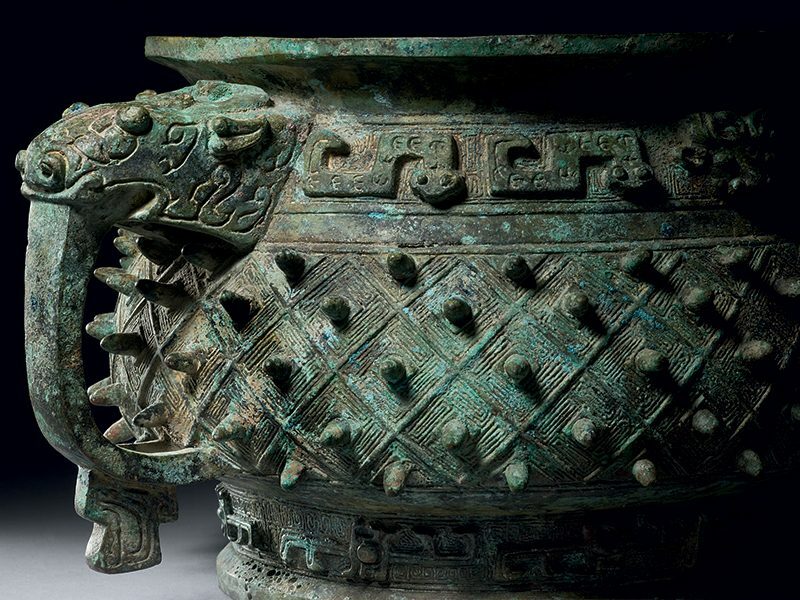 Archaeological excavations have shown that these vessels were so popular in Shaanxi province that they were considered typical of its bronze industry. This impressive gui with its unusually protuberant bosses that are almost like spikes, is extremely rare, and was probably manufactured in Shaanxi province. Four known comparable gui with a similar diamond-and-boss design and extra protuberant studs are all recorded to come from Shaanxi province: one with a cast character of the family name is dated to the late Shang dynasty; another dated to the late Shang or early Western Zhou dynasty was excavated from a hoard in Liquan county; a third was found in Qishan county; and the fourth is in the collection of the Linden-Museum, Stuttgart. Another closely comparable You Fu Gui with a similar diamond-and-boss pattern and with beast.headed handles, dated to the late Shang dynasty, is in the collection of the Shanghai Museum. A pair of bronze gui of comparable shape and style, dated to the early Western Zhou dynasty, was included in our 2000 catalogue and is now in an English private collection. The nineteen-character dedicatory inscription cast in the base of the interior mentions the gift of 5 peng (a unit meaning ‘ten’) shells from Shu Zhao Fu to the maker of the gui, who then made this previous vessel in gratitude for this generous gift. Rawson, J. 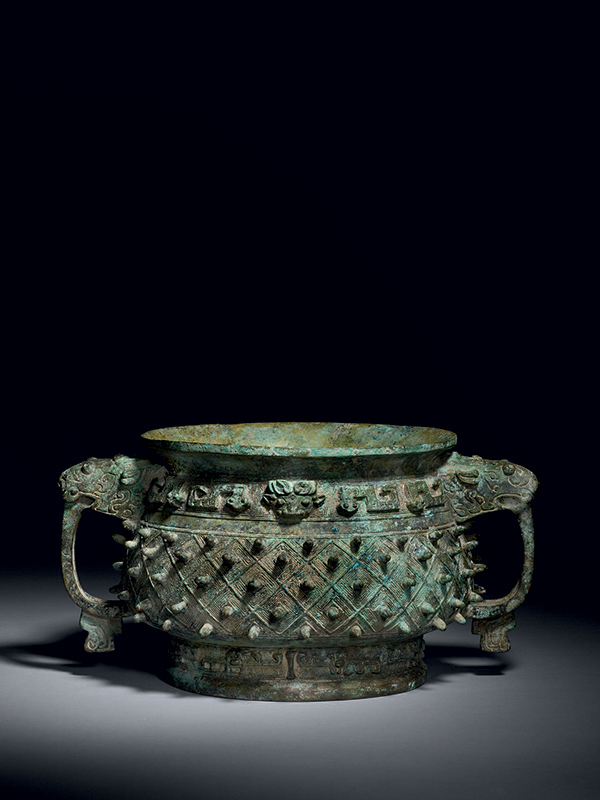 Western Zhou Ritual Bronzes from the Arthur M. Sackler Collections, vol. IIB, Washington D.C., 1990, figs. 41.1 and 41.2, p. 378. Rawson, J., op. cit., fig. 41.2, p. 378. Chen, P.F. Ancient Chinese Bronzes in the Shanghai Museum, Scala Books, London, 1995, no. 25, p. 52.